From ceremony to reception, live music can be the perfect accompaniment to your wedding day. 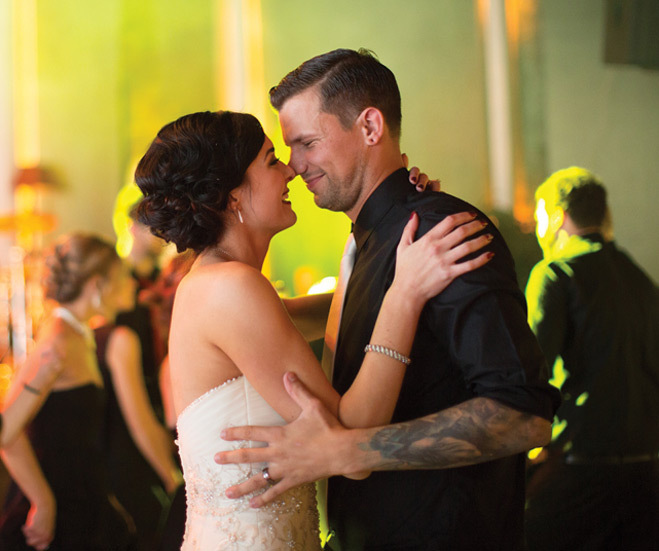 More and more couples are turning to on-site musicians to enhance their celebrations, trusting them to strike the right chord for each unique moment of the day. “Live music feels more elegant,” says Nate Berg of G.L. Berg Entertainment in St. Cloud. “It adds a lot to the energy.” Not sure where to start when it comes to bringing live music into your big day? Local experts share their insight and advice. It’s critical to get the music right during the ceremony, whether that means classical strings or pop songs. Traditionally, of course, ceremonies feature classical pieces, but some brides may not be familiar with the repertoire, and that’s where the pros come in. Anne Strasser of Crocus Hill Trio—violin, flute and cello—supplies couples with 10 songs representing a breadth of styles and then suggests a playlist based on the ones couples liked best. The resulting selection resonates perfectly with the couple’s tastes. Looking for something a little less traditional? Style-Architects director of weddings and events Rachelle Mazumdar sees ceremony music leaning toward more contemporary selections, with brides choosing movie scores or modern-day pop classics for their walk down the aisle, rather than mainstays like Pachelbel’s Canon in D.
While anything goes for a secular wedding, those holding a religious ceremony should consult with the institution’s music director to ensure appropriate and approved selections. Using musicians for the entire wedding day can get expensive. But, says wedding consultant Anna Senrick from Fête Perfection, you can maximize your budget when it comes to having live music in your wedding. She suggests using a musician or two from the dance band to play the earlier parts of the evening, like the cocktail and dinner hours. You can also reverse this idea for the cocktail hour and use a single cello player from the string quartet that played your ceremony. Beyond your budget, the size of your guest list also should inform your choice of musical group, suggests James Borden, owner of Musicians Unlimited. Five to seven pieces may be a big enough group for a 100-person wedding, while a larger band might work better for a reception of 300 guests. And be sure to match your band to the style of the venue, recommends Berg. A bar band won’t suit an elegant space, just as a formal, classical group may seem out of tune in a budget venue. It’s important to remember that dinnertime isn’t just about table chatter and background music. There are toasts and speeches, along with silverware-to-glass cues for newlywed kisses. Live music can enhance such impromptu moments. “If a piano is playing during dinner, the musician can create a quick ending to the song as needed,” says Borden. Another trend imported from the East Coast may help those torn between choosing a DJ or a band. Fusion groups, like Minneapolis’ Union, add live harmonies and melodies to the well-known songs played by a DJ. A band like Union—made up of a percussionist, saxophone player and keyboardist—provides the energy of a live band, but with the unlimited repertoire and flexibility of a DJ, which can come in particularly handy for requests. If a traditional dance band is more your style, Borden recommends starting with at least a five- to seven-piece band. If the budget allows, adding a horn section and additional singer helps achieve a sound closer to the original arrangements. Adagio Jazz Trio A three-piece jazz band adds class to your cocktail hour and can be combined with a live DJ for the dance. Bellagala Custom ceremony music packages from soloists to string quartets, plus access to reception musicians that range from traditional jazz to quirky mariachi. Belle Amour Jazz band sports a 1920’s look for nostalgic background music or a smaller stage show. Crocus Hill Trio Violin, flute and cello group plays classical and contemporary arrangements for ceremony and cocktail hour. Piano also available. Diane Martinson Experienced ceremony vocalist performs everything from classical hymns to modern love songs. Deuces Wild! Dueling Pianos Two pianists and an optional percussionist create interactive reception entertainment. Four Voices String Quartet Ceremony and cocktail music ranging from traditional religious songs to Coldplay. George Maurer Group Fronted by a main composer for the Minnesota Orchestra with a repertoire including classical, swing and classic rock. Lake String Quartet Two violinists, a viola player and a bassist supply the largest catalog in the Midwest. Loring String Quartet Versatile classical string quartet that boasts a huge repertoire. PopLuxe Six to 10-piece dance band that covers Frank Sinatra to Journey to Katy Perry. Award-winning dance band made up of six to 10 pieces, which can be slimmed down to the Mike Kearney Combo for cocktails and dinner for a nominal fee. Synergy Multi-piece band that specializes in everything from jazz to Top 40. Union Fusion group combines the energy of live musicians with the endless song list of a DJ. Zacc Harris Group Acoustic guitar and/or jazz quartet. A reception without music is like popcorn without butter; you know you want it, and everything just goes much more smoothly when you add it.